Thanks for the link! I suspected I was trying the wrong beta when I saw references to FreeBSD 10.2. Now I have reinstalled with t1n1wall 1.8.2b65. With this version I am able to login the VPN client and I can connect to resources on the local network. But I can not access the t1n1wall web interface. This t1n1wall beta behaves exactly the same way as smallwall does IMO. Are there some otions I need to tweek? Do you have a default rule in the VPN segment? Can you ping the firewall? Yes, I have a default rule for L2TP that allows everything to L2TP VPN clients. I can't ping the firewall LAN address and I can't connect to its web interface either. I can however connect to other resources (machines) on the LAN. I see no difference in how t1n1wall and smallwall behaves when it comes to L2TP/Ipsec. I've tried these options in L2TP rules. None of them works. Contact me offline next week and let me see if I can look into this. My e-mail is all over the smallwall website. Thanks Lee. I will do that. Since this is a test system, I can even give you full access to the machine. Thanks Andy! And I have been watching your work on 1.10 over at t1n1wall, and it is looking very good! I will try t1n1wall "generic-pc-1.8.2b71.img" and report back. I have now tried the above t1n1wall image with no success. I still have exactly the same problem. 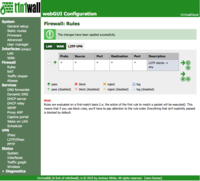 I can access resources on the LAN but I can not access the t1n1wall web interface while connected via L2TP/IPSEC VPN. Sorry for the long delay. I lost my old test machine. Now I have a new one with virtualization. This makes tests easier. I have installed two VMs. One with the latest smallwall beta (1.8.4b10) and one with the latest t1n1wall beta (1.8.2b78) in order to get to the bottom of theese L2TP/IPsec problems. I have set up both VMs identically, and so they behave identically. VPN users can connect ok. Local resources on the LAN are accessable to VPN users. 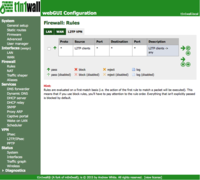 But NO resourses on the smallwall/t1n1wall LAN interface itself is accessable to VPN users. This seems to be exactly the same problem that I have decribed before (above). 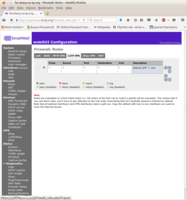 I'm happy to test whatever you think is neccessary, and I can easily install new versions of smallwall/t1n1wall on this server thanks to virtualization. So, other then the IP address changes, the rules are identical. But I have noticed that Andy is more focused on his 10 branch now then the 1.8 and I have even backported stuff that he did not. Just to make sure you have it covered, can you also test with 10 to see if the output is the same? Also, what client are you using? Is there a way to use something like wireshark to capture packets and see the difference between web on smallwall and web on a local client? Also, can you hit the captive portal on smallwall as it is a totally different service with a different web engine?